Invest in Replacement Windows. Invest in the Future of Your Home. Window replacement is an investment, one that should be made with a window company that knows Lees Summit homes. Renewal by Andersen® of Kansas City is deeply experienced in the local installation of new windows, having grown as a business right here in the Lees Summit area. As the exclusive local representative of the Renewal by Andersen® brand, we are able to provide homeowners with the dedicated care of a small business coupled with the top quality products and warranties of a national company. When you choose to work with Renewal by Andersen® of Kansas City, you become the most vital member of our team. Your project will run on a schedule that best fits your needs and your windows will be designed to fit your home and your sense of style. We offer a wide selection of expertly crafted replacement windows and our award winning design team will work with you to find the right fit for your Lees Summit home. Whether you want to install a large, elegant bay window in your living room or simply need to replace a double hung window in a bedroom, Renewal by Andersen® of Kansas City will deliver a valuable return on your investment. 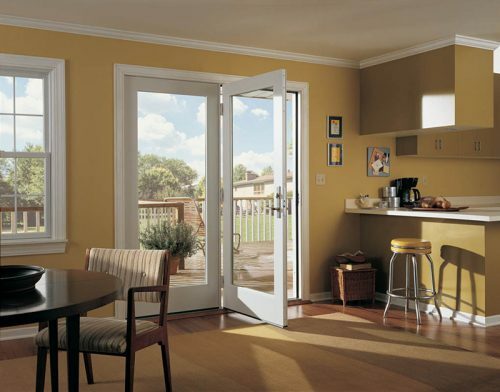 In addition to a full selection of replacement windows, we also install both French and Sliding patio doors. Our doors are produced using the same quality materials and expert techniques that are used to produce our windows, and are backed by the same deep warranties. To see our full selection of Renewal® replacement windows and patio doors, and to schedule your FREE in-home consultation with our Lees Summit window experts, call Renewal by Andersen® of Kansas City or Request an Estimate today! For a window replacement project you can trust, you need a contractor you can trust. In Lees Summit, that contractor is Renewal by Andersen® of Kansas City. Call us today at 913-385-1300 for a FREE in-home consultation with our home improvement experts.